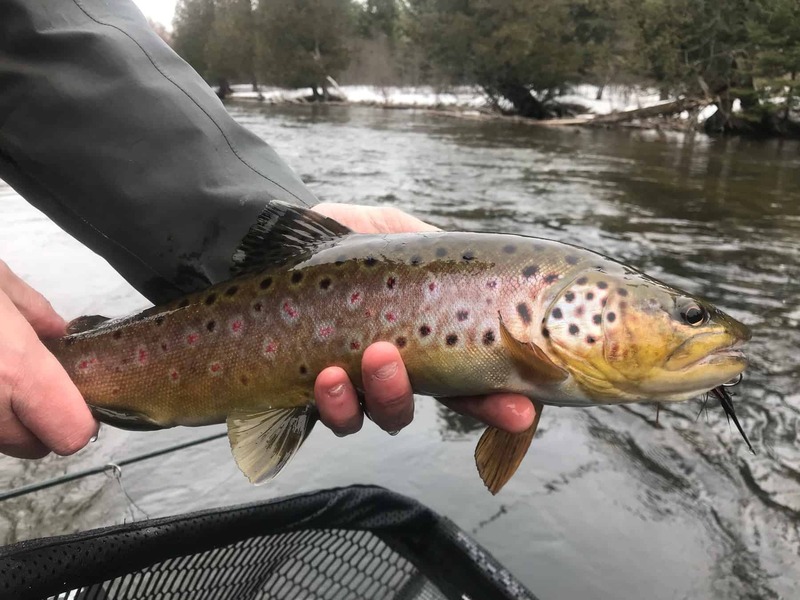 The slow thaw has made for some pretty good spring streamer fishing this past week. Not every day has been killer, but most days have been more than good enough. The river is back to running clear and this should hang on right through the weekend. While we all know and expect more winter weather, it will be the exception. Today on the North Branch: geese, wood ducks, black ducks, mallards, herds of deer in the cedars, beaver castor mounds, and brown trout. Also: no ice in the guides, one pair of socks, and light gloves instead of Siberian mitts for rowing. This is some of the finest streamer and nymph fishing of the year. 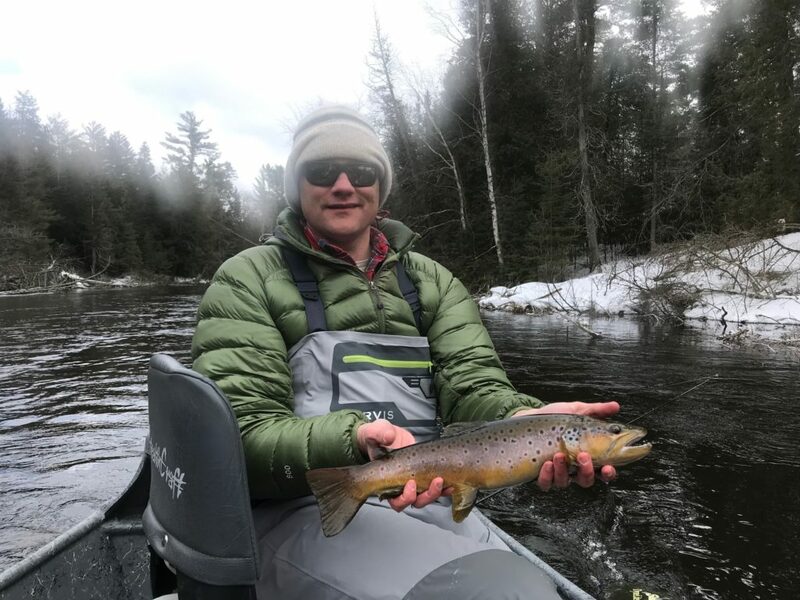 It’s also a great time to hire a guide as many of the accesses are currently impassable and the guides have this spring thing pretty well dialed. There have been some dandy trout caught this week. Today was one of those March days that creaks along like a train climbing a hill. We started with Greg moving a giant trout from a small depression along the bank. The trout emerged, navigated some submerged cover, mouthed the streamer, and then retreated. It was within five minutes of the start of the float. And it was the largest trout we saw all day. We then floated for a few hours and never saw a trout chase our streamer. We did, however, spook a lot of trout off the drop-offs. It was a good sign…but even good signs get long in the tooth when the fish will not chase the fly. In fact, I was saying something to that effect – bitching, in other words – when, as I pulled the fly from the water, a trout ate my fly out of the air and kept going into a jump. I may have screamed. It was, like all the fish from the last ten days, a strong fighter. It had a few leeches on it and I peeled those off, held it for a pic, and let it go leech-free and ready for spring. After that, the fishing improved considerably. Almost all the trout were in the middle of the river holding off some kind of depth change. 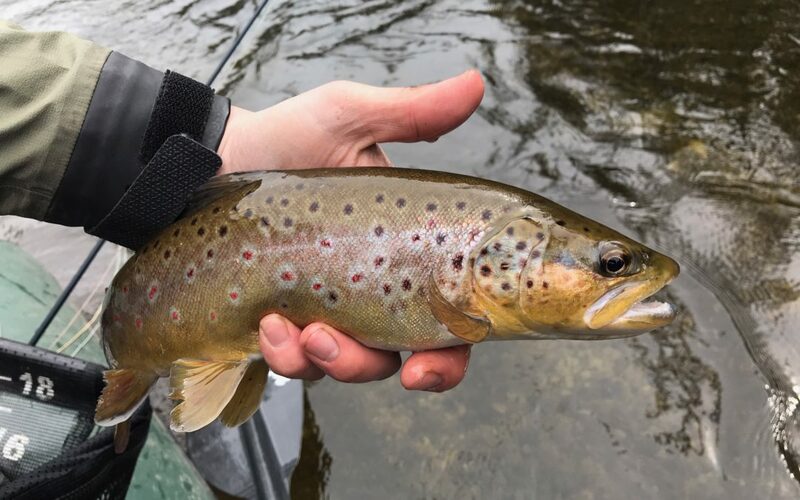 I was certain that an upstream nymph angler would have done as well as the downstream streamer angler today. Several of the fish we spooked from the middle were quite large and plainly visible. We fished black streamers on quartering downstream casts and made sure to mend the line down to sweep the fly across the middle where the trout were holding. Later in the day we moved some fish on olive and white. I still think black is tough to beat, but I like a little brightness in the streamers I fish at dusk. As for access for this weekend: ALL the side roads have been very icy and should be traversed slowly and with caution. Any seasonal side road, such as South Branch Road and Mason Tract Pathway, as well as Guides Rest, Lower TU, Jackson Hole and many on the Manistee, are really not passable. There are pluses and minuses to this. On the minus: hard to access. On the plus: hard to access. If you have to sweat to get in to the river, it means you’re likely the first one to do so since October. Savor that thought. You won’t get to have it again until next March. We have one spot remaining for Dennis Potter’s Terrestrial Tying Class on March 30. 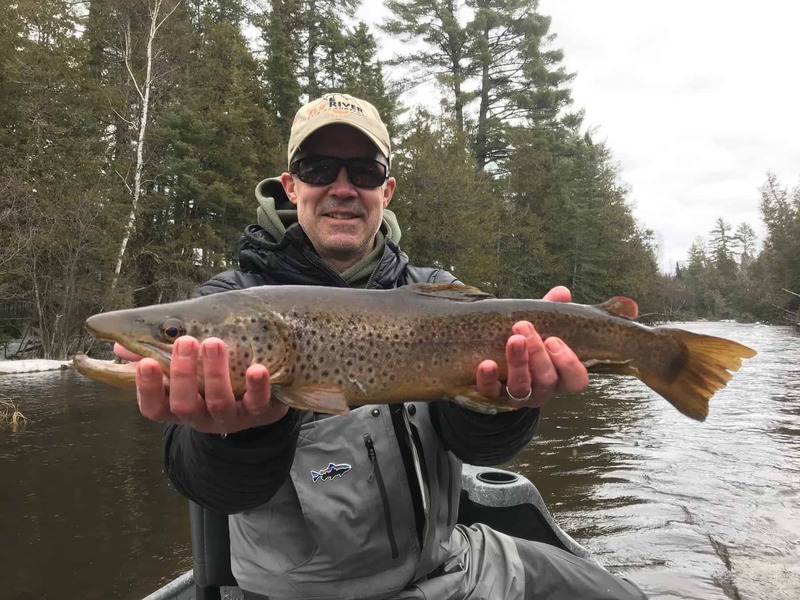 If you love to tie flies, and if you’re trying to figure out how to fish in the dog days of an Au Sable summer, this class will help you fill your box with proven terrestrials for this river. The Au Sable is a great terrestrial river…but not in the same way as other rivers. We are serving dinner and breakfast this weekend and anticipate more good fishing and pleasurable weather after a brief, and minor, cold snap on Friday. We’ll be in the shop if you want to learn more on rigging nymphs, selecting streamers, and other March/early April know-how. Our rooms are still at winter rates: $60/single, $75/double. Mary Gates passed away this week. Mary and Cal founded Gates Au Sable Lodge nearly fifty years ago. She ran Mary’s Hungry Fisherman, worked long hours, fed thousands, raised kids, and after Cal passed, ran the fly shop with her son Rusty. Mary was the original. Up until the end she enjoyed coming in for lunch and then stepping back into the kitchen to relive the years. She created and upheld a legacy here that we still feel, and will always feel, at 471 S. Stephan Bridge Rd.